A regional conference aiming to address social and women’s issues in conflict-ridden areas kick started Tuesday in Jordan’s capital Amman. The conference is sponsored by the Arab League, the European Union, the United Nations Development Programme, and Karama, a regional NGO. Women’s rights groups from Egypt, Libya, Yemen, Somalia and Morocco are also among the attendees. High on the conference’s agenda will be the volatile and often violent situations faced by women in conflict and war zones. Recommendations on how such challenges are to be overcome are expected to be reached. Jordanian Minister of Social Affairs Reem Abou Hassan said that along with the support dedicated to infrastructure, security and economy, rising to the challenge of meeting the cause of women’s rights remains a must. Haifa Abu Ghazaleh, Arab League assistant secretary-general for media affairs, said a conflict management unit has already been set up at the league, pending additional findings on the ramifications of conflict on women and children. 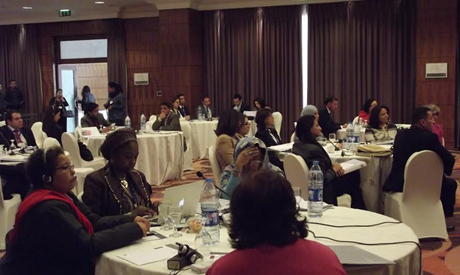 The larger aim of the conference, participants say, is to set in motion the second phase of an Arab dialogue begun in October 2013 at a regional training workshop held in Amman on women’s issues, peace and security. This article was originally published on Ahram Online.